Despite the rain and a bitter east wind the Dollar Ladies turned out in force to start off the season with a fun game of golf. It was the team of Captain, Elaine Williamson, versus that of V/Captain, Catherine Macdonald, and by way of variety, a tennis racket and tennis ball was used at the infamous 2nd hole - all to no avail! However, overall it proved a close match with the Captain's team taking the honours by 2 points and congratulations to Moragh Dunning for the 'longest drive' and Joanna Bridges for 'nearest the pin'. There was a good field for this annual autumnal challenge over the slopes again this year. As ever it was windy, chilly first thing but it was dry throughout with some sunshine for the later starters. The golf was of a high standard and closely contested but it was Helen and Carol Ann whose steady round topped the leaderboard. 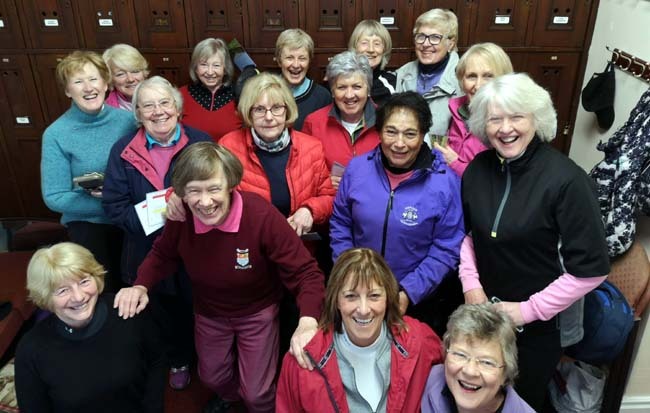 Closing Meeting - 21st October 2018 The Ladies closing meeting 2018 was coupled with the Captain's Prize and held on Sunday 1st October. It proved an interesting afternoon in some sunshine when the Ladies made it a �fun� event over twelve holes. Topping the leaderboad was the winning pair Kayleigh Caine & Carol Caren, second Maria Symington & Di Dunning and third Moragh Dunning & Janette McMillan. The Inter Club Pairs competition was held at Dollar on Thursday 16th August. Three teams competed over the slopes and despite the mixed weather it was an occasion generally enjoyed by most of those playing. In the event it was a fine win for Dollar who returned a combined nett score of 233.5. In second place was Braehead with a combined score of 240 and in third place Tillicoultry with 261. It was on Wednesday 15th August 2018 that two ladies from the Czech Republic, a mother with her daughter, who had been playing in the under-23 Open International competition at St Andrews, were sightseeing in Dollar. Seeing the sign to the Golf Club, they came to look at the course and the clubhouse where they encountered Moragh Dunning who invited them to join the Ladies Wednesday lunch. They were pleased to accept and their company made for an interesting and enjoyable lunchtime break for all. Coaching 2018 Following their completion of seven sessions of coaching in August by golf professional Scott Borrowman (a Dollar Member) the Ladies look happy that Scott, an understanding and excellent coach, has given them all the full treatment and no doubt they have learnt much to improve their game. 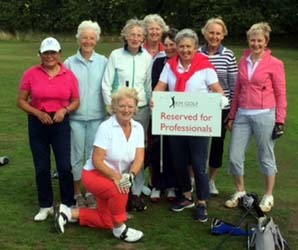 The Ladies Outing this year took place at Pitfirraine Golf Club. The course was in excellent condition and the food and hospitality top notch. The ladies, playing in teams of three with the best two Stableford scores counting, produced some great golf. It was the team of Maria Symington, Joanna Bridges and Kate Brodie who took the honours with a winning score of 82 Stableford points. The longest drive went to Kate Brodie and nearest the pin to Maria Symington. The winner of the Rake (most bunkers) was shared between Catherine Shaw and Fiona David. Roll on Outing 2019! Moragh Dunning (left), near 30 years a member and past President of the Ladies Club, won through to contest the final against the in-form Maria Symington over eighteen holes on Sunday 8th July. Baked hard in the summer heatwave and in a stiff breeze the course was far from easy, an unpredictable bounce and a running ball needed some canny course management. Whereas both players coped well it was Moragh, a worthy Champion, who put together a very steady round to take the match four holes up with two to play. The newly introduced Handicap Championship was a repeat of the last two years of the Bronze final - Carol Caren playing Linda Sommerville. Again both played well in the difficult conditions with Carol taking an early lead but Linda came back strongly before Carol closed out the match by two holes up with one to play. TRI-AM ~ SATURDAY 12th MAY 2018 The sun came out today to welcome the lady golfers to Dollar for the annual Tri-Am. The course was in great conditions thanks to our hard working greenkeepers and although the greens were as tricky as ever the putts were running well and there were some good scores returned. The format of the competition was that at sixteen of the holes only one score counted but at the other two all three scores were required which made for an interesting variation. It was the Muckhart trio of Barbara Whitlock, Anne McCrorie and Val Dalton (below) who took the honours with a fine score of 80 beating Hazel Hume, Joanna McIntosh and Alison Boyes with the better inward nine. In third place were Elaine Williamson, Rosemary Easson and Jane Ferguson with 83. A good day of good weather, good golf and good company. There was a vast selection of mouth-watering entries for the fundraising "Bake Off" in aid of "Stand up to Cancer" in the clubhouse on Saturday 28th April. With temptation too great for players and visitors the event raised an amazing sum of �525. Thank you Margaret, Fiona and Catherine for the arrangements and display and to everyone who either baked, judged or enjoyed tasting all this wonderful baking. Junior Baker: Claire Bridges with her iced almond and vanilla biscuits. Savoury Baker: Hector Brodie with his savoury lamb and black pudding pies. Sponge Cake Baker: Christine Hogg with her coffee cake with chocolate icing. Pictured above Lady Captain Elan Borrowman (on the left) presents Christine Malcolm with the Certificate of "Honorary Life Membership" of Dollar Ladies Golf Club. Christine is a staunch supporter of the Ladies and the overall club. She is by far the longest serving member having joined as a Junior on the 3rd January 1948, 70 years - who can beat it? As well as a regular competitor with more than a few trophies she has been active in club management and, in recent years, a valued assistant looking after the Juniors. She was also instrumental in the setting up of the popular Calcutta Cup which competition has origins in her family's golfing life and it was her mother who donated the Mary Wiliamson Cup. Congratulations Christine and may you continue to enjoy your golf at Dollar. Exclusive to members of SGU and SLGA affiliated golf clubs, the new Scottish Golf Card will add value to your membership and bring you a number of national benefits and special offers to enhance your enjoyment of playing golf in Scotland. The Scottish Golf Card is coming soon! The Scottish Golf Card, sponsored by Scottish Hydro, has been created jointly by the Scottish Golf Union and Scottish Ladies� Golfing Association, and is designed to identify golf club members and offer preferential benefits in addition to your existing club membership. On 6 June 1896 Mrs Alice P Gibson, Hon. 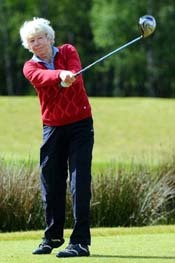 Treasurer of Dollar Ladies� Golf Club, wrote to Mr Willie Park of Musselburgh seeking his advice. The letter enquired whether it was permissible for the Lady Members to have �gentlemen friends� acting as caddies. Mr Park (pictured left) drafted his reply on the back of Mrs Gibson�s letter and stated that it was �quite usual" for a gentleman to carry a lady�s clubs and to coach her in a competition. In the postscript of her letter it is noted that Mrs Gibson stated that she had been purchasing clubs from Mr Park for the Dollar Ladies� Golf Club for four years. Could this be the earliest reference to the Ladies� Club? 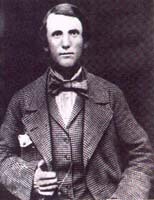 Mr Willie Park Jnr was Open Champion at Prestwick in 1887 and Musselburgh in 1889. Both he and his father were from golf�s leading family of the 19th century and thanks are due to Mr Mungo Park of Gloucestershire who forwarded a copy of this letter to Dollar. He had found it in the proof copy of the second edition of �The Game of Golf� written by his great uncle - Willie Park Jnr. To see a copy of Mrs Alice Gibson's letter and the draft reply ........ CLICK HERE. It was a lady who, in 1906, drove off at Dollar to open the first eighteen-hole course in Clackmannanshire. She was the Countess of Mar and Kellie (right) and although long since changed it remains typical of a traditional Scottish village golf course. Presenting an interesting and varied challenge it is hardly long in yards or in time to complete � ideal for the modern lady with her many responsibilities. The complete absence of bunkers and the removal of the short rough between adjoining fairways are factors which saw the SLGA reduce the standard scratch in 2005 to 67, one below the par of 68. However, as a hillside course there is the variety of slopes to contend with, a burn features on some seven holes and although at 71 yards the second is the shortest hole on the course the approach is near vertical! The other four par three holes, however, are relatively long and good tee shots are required to find the greens but this is more than balanced by the fact that reaching the par four holes in regulation is well within the range of the average player. The one and only par five takes the player along the highest part of the course where the views are spectacular, enjoy them and relax in the knowledge then that its all down hill to a warm welcome in the Clubhouse. Click here for a panoramic (261 KB) overview of Dollar Golf Course. News, comments, contributions, letters, photographs, etc relating to golf and/or this site are welcome and can be submitted personally to the Hon Secretary or by e-mail, telephone or letter.